This mod simulates early and late autumn. Place above sound mods to remove summer sounds like insect noises. Works with Promods, TSM, Rus Map, MHA, and others. 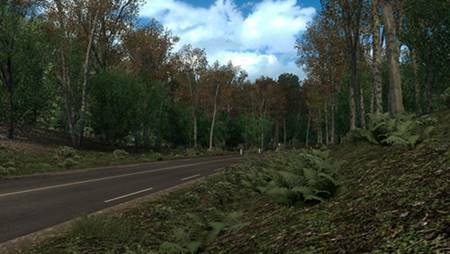 Early & Late Autumn is a weather and graphics mod so other weather and environmental graphics mods should be disabled. Early & Late Autumn should be given a HIGH priority in Mod Manager. Extract scs files from RAR and place in Mod Manager. Please note that early & late autumn are two separate mods and should not be used together.